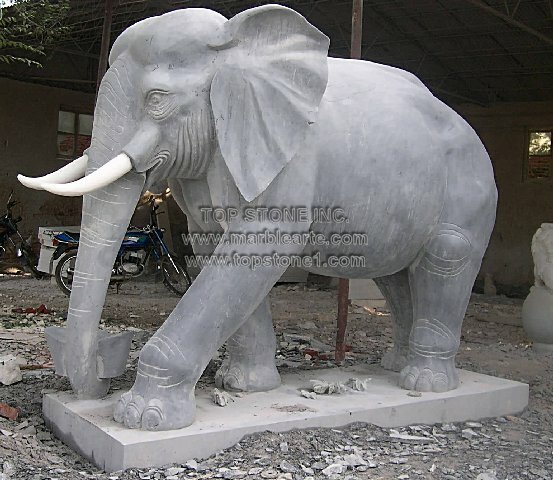 Description: TSAL005 - A sculpture that shows tremendous promise is the ElephantWalk. Made from Italian marble and carefully etched features, this is one of the many animal statues that lean towards being both a religious art as well as an unrivalled marble statuette. Not only are these marble elephant statues a sharp way of sizing down those landscape statues, but also as a garden ornament works well with blending nature with statuesque life. Bring these marble arts to your doorstep today by investing in our hand carved marble creations. Does the idea of marble elephant statues strike a chord within your artistic mind? Well be armed with your wits, because, this Gentle Giant is on its way to becoming a star. As one of the best marble statues to date, this sculpture demonstrates the dual role of art marble and stone magnificence. It features as religious art as well as one of the many marble animals to dip into the coffers of custom made statues for homes, and deities for temples. If you take a keen look at its décor you will find its lifelike depiction quite uncanny. With a granite-like texture, its smooth finish will leave you anticipating its rustling breath any minute. With a larger frame, this can be set as massive monuments as landscape statues or as large garden sculptures, or whatever else suits your fancy.